Knowledge is the perception of the agreement or disagreement of two ideas—John Locke (1689) BOOK IV. Of Knowledge and Probability. An Essay: Concerning Human Understanding. First, there is content: "a fluid mix of framed experience, contextual information, values and expert insight." This includes a number of things that we have within us, such as experiences, beliefs, values, how we feel, motivation, and information. The second part defines the function or purpose of knowledge, "that provides a framework for evaluating and incorporating new experiences and information." Notice how this relates back to Locke's definition — we have within us a framework (one idea) that we use for evaluating new experiences (the second idea). Achterbergh & Vriens (2002) further write that the function has two main parts. First, it serves as a background for the assessment of signals, which in turn, allows the performance of actions. As to the first part, they write, “To determine whether a signal is informative, an observer has to 'attach meaning to it,'” i.e., to perceive and interpret it. Once perceived and interpreted the observer may evaluate whether the signal is informative and whether action is required. Two important concepts in understanding how knowledge transfers to others are Velocity and Viscosity (the speed at which knowledge travels and the richness or thickness of it). Explicit knowledge can be articulated into formal language, including grammatical statements (words and numbers), mathematical expressions, specifications, manuals, etc. Explicit knowledge can be readily transmitted others. Also, it can easily be processed by a computer, transmitted electronically, or stored in databases. Technical Dimension (procedural): This encompasses the kind of informal and skills often captured in the term know-how. For example, a craftsperson develops a wealth of expertise after years of experience. But a craftsperson often has difficulty articulating the technical or scientific principles of his or her craft. Highly subjective and personal insights, intuitions, hunches and inspirations derived from bodily experience fall into this dimension. 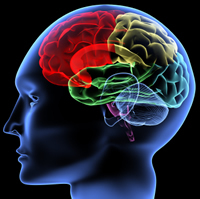 Cognitive Dimension: This consists of beliefs, perceptions, ideals, values, emotions and mental models so ingrained in us that we take them for granted. Though they cannot be articulated very easily, this dimension of tacit knowledge shapes the way we perceive the world around us. Socialization: from tacit to tacit — Sharing experiences to create tacit knowledge, such as shared mental models and technical skills. This also includes observation, imitation, and practice. However, “experience” is the key, which his why the mere “transfer of information” often makes little sense to the receiver. Internalization: from explicit to tacit — Embodying explicit knowledge into tacit knowledge. Closely related to “learning by doing.” Normally, knowledge is verbalized or diagrammed into documents or oral stories. Externalization: from tacit to explicit — The quintessential process of articulating tacit knowledge into explicit concepts through metaphors, analogies, concepts, hypothesis, or models. Note that when we conceptualize an image, we express its essence mostly in language. Combination,: from explicit to explicit — A process of systemizing concepts into a knowledge system. Individuals exchange and combine knowledge through media, such as documents, meetings, and conversations. Information is reconfigured by such means as sorting, combining, and categorizing. Formal education and many training programs work this way. 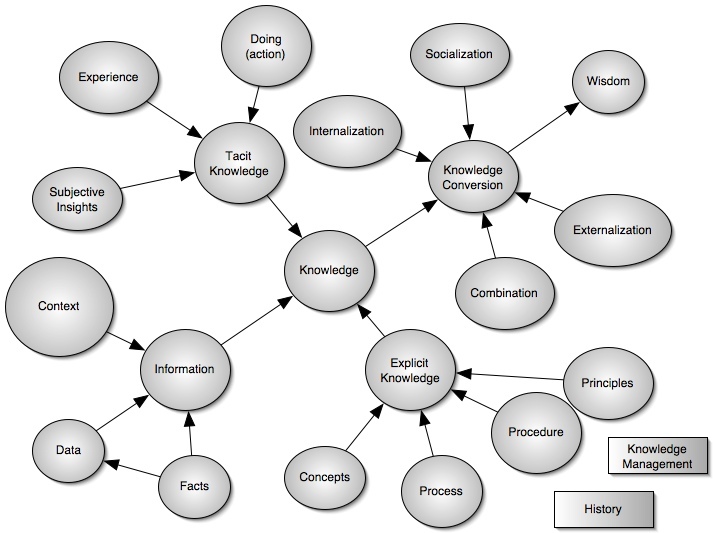 Artifacts derived from knowledge creation are facts, concepts, processes, procedures, and principles. These, in turn, are used to help create knowledge in others. Achterbergh, J., Vriens, D. (May-June 2002). Managing viable knowledge. “Systems Research and Behavioral Science.” V19 i3 p223(19). Davenport, T., Prusak, L. (1998). Working Knowledge. Harvard Business School Press: Boston, MA. Krough, G., Ichijo, K., Nonaka, I. (2000). 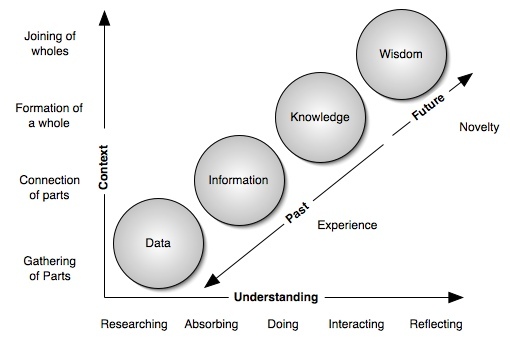 Enabling Knowledge Creation. New York: Oxford University Press. Updated July 1, 2012. Created May 10, 2004.